USS Fitzgerald Leaders Punished, Crew Is Praised After Collision With Cargo Ship : The Two-Way "Through their swift and in many cases heroic actions, members of the crew saved lives," the Navy said. It also blamed an avoidable crash on inadequate leadership and flawed teamwork. The guided-missile destroyer USS Fitzgerald returns to port after colliding with a merchant vessel in June while operating southwest of Yokosuka, Japan. The U.S. Navy has relieved the USS Fitzgerald's commander and two other senior leaders of their duties — and it's also praising the crew for saving their ship after the destroyer collided with a large Philippine-flagged container ship off the coast of Japan on June 17. "It was also evident from this review that the entire Fitzgerald crew demonstrated real toughness that night," the Navy said. "Following the collision these Sailors responded with urgency, determination and creativity to save their ship." Inadequate leadership and flawed teamwork contributed to the crash, the Navy said after releasing the findings of its investigation into the crash. It also blamed poor seamanship by the crews of both the guided-missile cruiser and the ACX Crystal, whose gross tonnage was triple that of the U.S. ship. 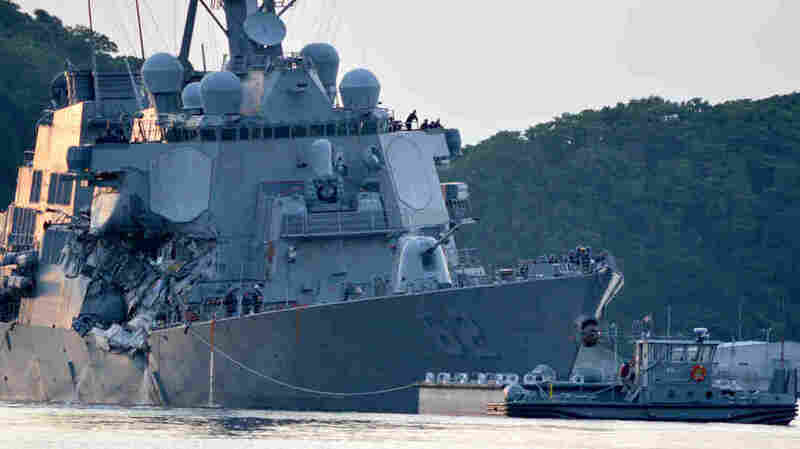 How Could The Navy Destroyer Collision Happen? Seven members of the Fitzgerald's crew died in the collision, which bashed in a large section of the ship above the waterline and caused extensive damage below. Water poured in through a large gash near its keel — a 13-by-17-foot opening that was made by the cargo ship's bulbous bow — as sailors responded to an emergency around 1:30 a.m.
"Through their swift and in many cases heroic actions, members of the crew saved lives," the Navy said. The report found that the sailors responded to flooding, structural damage and reports of a fire as they worked to restore the ship's power, propulsion and guidance. The damage spanned two decks, and water poured into the ship — particularly into Berthing 2, which held 42 beds and a lounge for the crew. By the time one sailor jumped from his top bunk, the water was chest high, the Navy says. Of the 35 sailors who were in Berthing 2 when the ship was struck, 28 escaped the flooding and seven sailors died. The area flooded in a span of 30 to 60 seconds. "The last Sailor to be pulled from Berthing 2 was in the bathroom at the time of the collision and a flood of water knocked him to the deck (floor). Lockers were floating past him and he scrambled across them towards the main berthing area. At one point he was pinned between the lockers and the ceiling of Berthing 2, but was able to reach for a pipe in the ceiling to pull himself free. He made his way to the only light he could see, which was coming from the port side watertight scuttle. He was swimming towards the watertight scuttle when he was pulled from the water, red-faced and with bloodshot eyes. He reported that when taking his final breath before being saved, he was already submerged and breathed in water." The ship's commanding officer, Cmdr. Bryce Benson, was trapped in his cabin, which was hit by the Crystal's bow. After sailors used "a sledgehammer, kettlebell, and their bodies" to break through the door, the amount of debris forced them to remove the door's hinges to pry it open enough for a person to squeeze through. 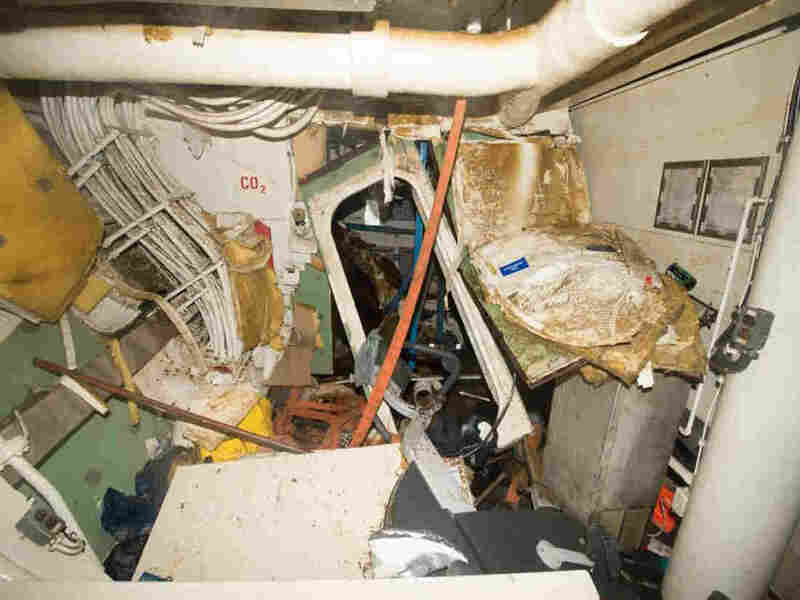 The lounge area of Berthing 2 on the USS Fitzgerald, looking toward its exit, as seen in a U.S. Navy report on the destroyer's collision in June. A helicopter was later used to take Benson to a naval hospital in Japan. After the crash, the Fitzgerald switched over to using paper navigation charts due to a loss of its systems. The damage limited the Fitzgerald's maximum speed to 5 knots and gave the ship a 5-degree starboard list. After it arrived in port, divers recovered the bodies of seven crew members. Benson had already been temporarily relieved of his duties due to injuries he suffered in the crash. He's now being reassigned to the Navy Yard in Washington, D.C., where the Navy says he'll be able to receive medical care. Several junior officers were also relieved of their duties, the Navy said.